Of course, a collection of Vira Matkovska emerged right away. Initially, the captured patterns in old chemise, she made a blouse. However, seeing an endless variety of patterns and techniques of the old shirts, realizing it was better not set, but the masterpieces of women's needlework, vanishing, you must find and save. Hobby was subordinated, first, the family's financial capacity: on the field is all life, and family experienced hard times. For many years denied himself in any women's whims and joys for the sake of collecting. Not always understood and familiar friends. Therefore, Vira is very grateful to her husband for being always shared and encouraged her passions. Formation of the collection would not be possible without his moral - and financial support. Daughter also of respect for mother's case. As ever Vira's without parents instilled in mentoring and forcing their children to love and native people of Ukraine and their spouses Matkovski brought life example worthy daughters of the Motherland. Ludmila and Julia modern girls who follow the latest trends in fashion, but are not ashamed to wear the national dress and speak their native language not only in Kiev, where they now reside, but also in other capitals of the world where they are called to guide the study or official matters. Even more, they managed to "infect" slap their friends who also already parading in embroidered shirts with jeans. 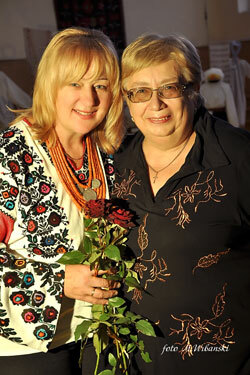 In recent years, Vira Matkovska active in the field of restoration of embroidery craft of Borshchiv. It involves working with women of the villages, giving them orders to take thems from old patterns of modern men's shirts or women's blouses, which are then are gifts to Vira's friends. A lot of energy, inspiration and love for folk art collector puts the promotion and development of local traditions of embroidery. Her shirt are for free use in the Ternopil Philharmonic concerts of artists, including vocal trio Solovi Galychny, Philharmonic Choir. 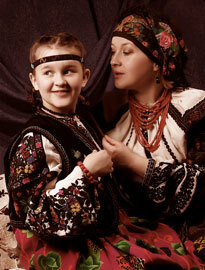 And who is not admired from Ternopil during concerts magnificent needlework school choral students "Zorynka"! 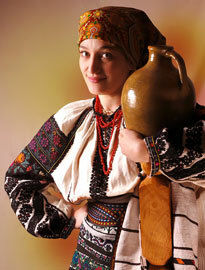 Thanks to artists with original sights Borshchiv, not ersatz stage seen in all parts of Ukraine and abroad. Actually in the advantage of private collections, that in this way can serve people. Shirts collection as free gives to students and amateur teams - members of People's verteps Ternopol and Borshchiv. Door to her apartment is open to researchers of Ukrainian traditional art, artists, masters of folk embroidery, museum workers. Collection examined Peter Gonchar and Nina Matvienko, then in true Vira established friendly relations with glorified singer. 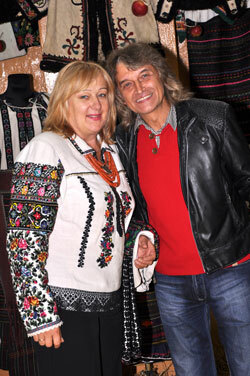 Shirts collection is now in the wardrobe opera prima Stefyuk in Lviv artists famous duo "BANDURA". In 2006, the vocal trio the Ternopil Philharmonic "Solovi Galychny" performed in the Mariinsky Palace in the diplomatic meetings involving the President of Ukraine Viktor Yushchenko. 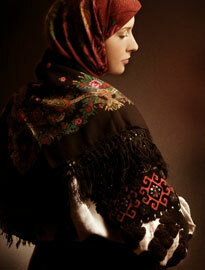 Artist, as always, were dressed in luxurious embroidery of Borshchiv from Vira Matkovska's collection. Late night Viktor Yushchenko and his wife came to girls. 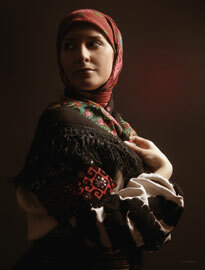 President, looking at the diversity of flowers embroidered on the cloth, said: "Katya, this shirt you do not have ...". The first lady asked the Ternopil girls where this exquisite dress. And for a while Yushchenko at the next formal meeting was dressed in a dress, clothes and decorated with motifs of traditional Borshchiv shirts. In such a model wife dress shirts inspired by the President of the Vira Matkovska's collection. In many ways to get a shirt collection. She started to buy at markets. Individual copies - gifts of friends and acquaintances. Sometimes the collector goes into a sort of mini-expedition to buy some interesting instance of the shirt (note, not always well maintained). And then have to wash and clean and reconstruct the lost pieces of embroidery. She enjoys touching the living past, through the homespun cloth handmade thread, many stitches, which could cover the whole planet, feels warm hands of women who made such beauty. Each shirt (they have several hundred) has a history collected and saved for posterity efforts Vira Matkovska. Without her enthusiasm, commitment, personal financial costs a lot of shirts just be killed for future generations. 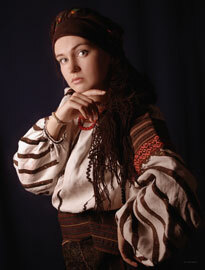 Collector dream is to create a museum or art gallery studio, where operating a showroom, workshop for everyone to master the art of traditional embroidery techniques, was inaugurated rolled sheets and other components of traditional dress Podolski for newlyweds who want to become a wedding napkin in special Ukrainian national burden. For most shirts in the collection - wedding, and good energy ancestors fortunately, the share transferred newlyweds.